Rogue Trader has crash-landed straight onto my table. 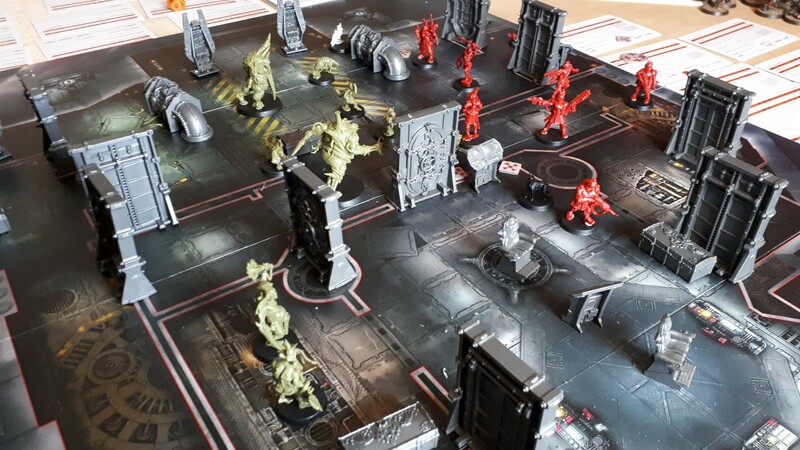 With new models, a new double-sided board and some new rules to dig into, I was eager to keep on feeding my appetite for skirmish warfare. I’ve been playing a considerable amount of Kill Team lately and so was more than happy to dive into this expansion for the game system. I wasn’t hoping for a great deal of contrast or difference from the core set. I was, however, very pleased with my findings. The first thing I’ll highlight here are the models. Each model is brimming with character and personality. Somehow, Games Workshop have taken helmet-wearing, faceless, human characters and left me feeling somewhat interested and invested in them. Each of the sculpts for the Elucidian Starstriders is unique with each model brimming with magnetism and dynamism. This is especially true for the more individual characters such as the rotor cannon wielding fighter and Elucia Vhane herself. The precious canine companion alongside them only sweetens the deal. For the first time in memory I’m actually interested in the less spiky characters of 40K! Putrid and foul, the Gellerpox Infected themselves are just as blessed with their astonishingly detailed models. My particular favourite of these guys is “Big Spike” who features a mutated fly creature where his right arm should be. You’ve likely seen, these models boast highly impressive levels of detail also bolstered by fantastic poses befitting of these foul monstrosities. 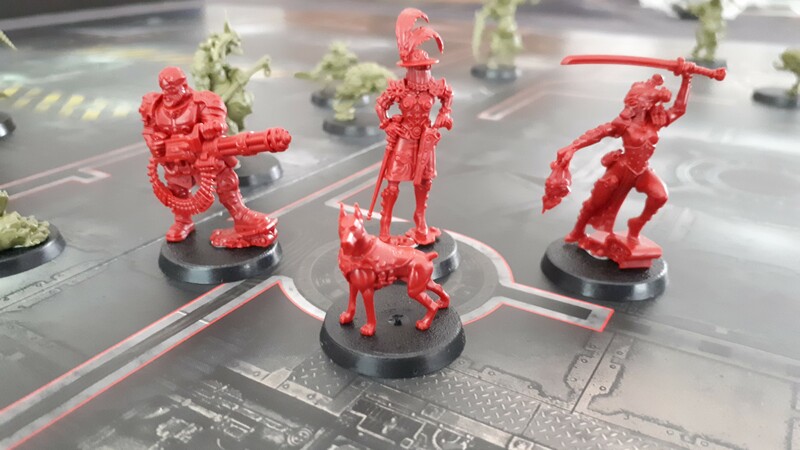 Whilst I’d not encourage the purchase of the Rogue Trader box solely for the models, I’m not sure I could hold disappointment against anyone who did just that. It’s also worth mentioning that it comes with a fair amount of scenery to boot. Various doors/bulkheads, some piping and crates are included, for instance. These are essential to get the full “Rogue Trader” experience which takes advantage of new rules. Though, the new scenery isn’t honestly exciting enough to write home about. At a glance the bulk of the rules don’t seem a colossal leap from the Kill Team rules released mere months ago. Nor would you expect it to be, since it’s merely an expansion. It follows the Kill Team formula with both of the included warbands permitting varied and contrasting play-styles. However, I did find many of the new gameplay additions in Rogue Trader to be particularly welcome. The inclusion of doors and control panels a la Necromunda Underhive adds a wonderful layer of forward-step-thinking which can make or break a game. This coupled with the wonderful board accompanying the box help to truly depict the cramped and confided environments of fighting aboard a void craft. The missions available within the box truly help to mix up the Kill Team formula without re-writing it completely. Not to say I was getting tired of the “kill everyone” or “run to the far side of the board” Kill Team missions. It’s simply that these new missions just feel great to play within Kill Team. They help to just invoke that extra fabric of strategy to help keep the games varied and dynamic. Simply put, this feels like a core part of the Kill Team experience giving the game even further life-span than I had predicted. There’s yet more on offer within Rogue Trader, though. You, of course, receive sheets of tokens for use in the game for both warbands. The game also comes with a handful of cards for both tactics and fighters, proving very handy for reference. You can even use both of the kill teams within Warhammer 40,000 proper thanks to the included mini-codex printouts included. Though, personally I don’t think I’ll be fielding the Gellerpox Infected with my Death Guard anytime soon. Being blunt, there’s little about the box I don’t truly admire or revel in. Something that furrows my brow is the curiosity of why these elements were released in an expansion. Why could they not be included with the initial Kill Team rules or release? The cost also sits uneasily with me, with the core box and expansion both being the same price. Paying for both to get what feels like the “complete” experience leaves me feeling perturbed and a little stung. That aside, I simply cannot question the quality of the Rogue Trader expansion. The miniatures that come within are some of the best I’ve seen from Games Workshop in memory. The scenery you get is a considerable amount and almost vital to the gameplay. The rules and added features to the Kill Team system really give it just a little more richness. I’d say if it was part of the initial release I’d have found myself in Kill Team heaven! If Kill Team still brings you hours of enjoyment, the Rogue Trader will certainly bolster this. That’s if you don’t mind forking out for it. As ever, if you want all the latest news and updates in tabletop, check us out on Facebook. Warhammer 40K Codex: T’au Empire Review – The Greater Good Just Got Greater! Necromunda – The Scavvies are back in town. Your last point is my only point. 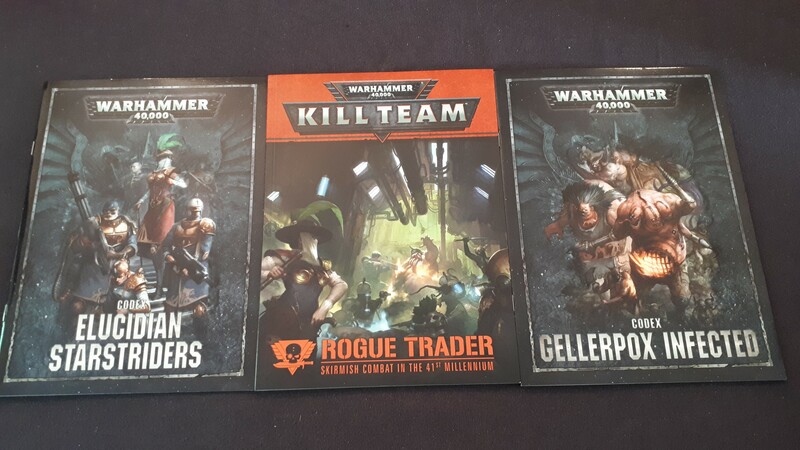 I bought kill team and now I have to buy “kill team” again for the same price? It also comes with two completely new unit types that you can only get in that box. GW even advertises how unique and awesome the rules for these new units are with the new specialists. They should have released this box first. Then added the current set as a lower cost add on to the original. I love the models but Kill Team just came out. I bought that and I bought the tooth and claw box along with Wolf codex, dice and data cards. That’s over $300.00 dollars worth of product that I still haven’t finished building and painting. I actually very disappointed with GW for the first time in a long time.